Acne treatments can be notoriously pricey, but brace yourselves: Neutrogena has just rolled out something that we can totally afford and we are so pumped! Wait. It gets better: This clear skin solution doesn’t involve taking any pills or using any painful lasers — actually, Neutrogena’s newest release is probably something that’s totally intrigued you in the past. Why? ‘Cause it’s a celeb favorite method and you’ve probably seen it all over your Instagram feed. Here’s the deal: You know those crazy-looking white masks celebs wear in their more “unfiltered” selfies? Yeah, that’s essentially the concept behind this product from one of our fave drugstore brands — Neutrogena. Celebrities like Jessica Alba and Kourtney Kardashian have used the pricier version of this (and hello, who wouldn’t want to look like those stunning ladies? Talk about #skingoals). They’re not the only ones loving the concept: An Us Weekly writer made a glowing (uh, no pun intended) endorsement as well. The only problem, of course, is that the OG costs $1800. Ouch. We know what you’re thinking: The real-deal celeb option might be amazing…but can it really be replicated at a fair price point? Apparently it can! According to Allure, the $40 Neutrogena version actually works to clear up and smooth out stubborn skin. They even had an expert explain why this works on a scientific level: “Blue light excites chemicals within acne-causing bacteria to the point of death,” dermatologist Brian Zelickson said. Sounds good to us! Are you as excited about this release as we are? 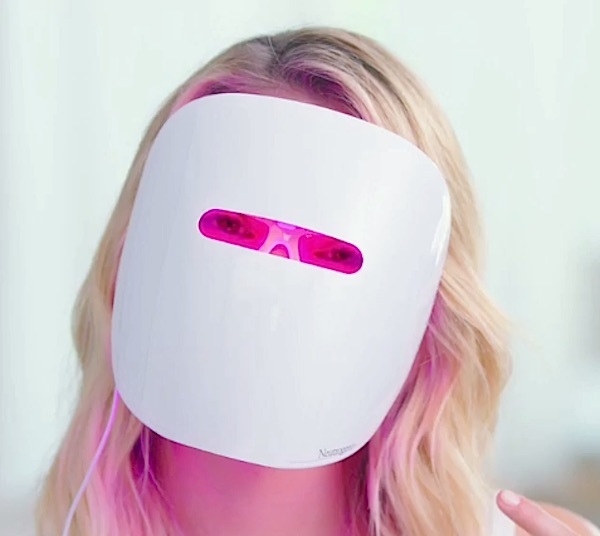 If so, pick up your very own Light Therapy Acne Mask here!